Timesheet data is useful for tracking your employee’s attendance, how much you’ve spent working, and how much you need to invoice your clients. To help you do just that, here are the best 7 timesheeet apps, with highlights on their most notable features: Clockify, Toggl, Harvest, TimeCamp, Hubstaff, RescueTime, and TSheets. For a super detailed feature-by-feature breakdown, check out the comparison page. Clockify is a free standalone work hours tracker and timesheet with project and team management features. With Clockify, you can track time as you work on an activity, add time manually, enter it in the Timesheet, and further manage it by editing, deleting and specifying these time entries. Later on, you can generate Visual and Weekly Reports of your tracked time, export these Reports as PDF or Excel files, or save them. Clockify is 100% free for an unlimited number of users who need basic time tracking features, and its paying plans offer various additional permission options, productivity and Report features, and complete data privacy and control. Considering it offers straightforward time tracking features, and everything you need to manage multiple users, projects, and billable time, Clockify is suitable for freelancers and teams, but also large organizations who value extra data control. We have made a super collection of ready-to-print daily, weekly, and monthly timesheet templates. You can download our free timesheet templates here. Toggl is another standalone work hours tracker, with project and team management features, although with more limitations in terms of what you get for free. With Toggl, you can also track time as you work on activities, add it manually, and manage your time entries by editing, deleting, and specifying them. Later on, you can also generate Reports, and export them as PDF and CSV. Toggl offers the most basic time tracking features for free for up to 5 users, while it’s paying plans offer basic and additional time tracking features for unlimited users, various permission options, and productivity and Report features. Overall, Toggl’s features make it suitable for small businesses and freelancers who need time tracking basics. Harvest is a time tracking app with expense tracking and invoicing features. This app also offers basic time tracking features, and you can add and edit time you spend on activities by going over the days of the week. You’ll be able to manage projects and clients, generate Reports, but also track your expenses and generate invoices. Harvest is only free for 1 user and 2 projects, and you’ll have to upgrade to a paying plan for more options, which include unlimited projects for 1 user or a team, and other additional options. Overall, Harvest’s features make it suitable for small and mid-size businesses mostly interested in invoicing and expense tracking. Hubstaff is a time tracking app with employee monitoring features. This app offers several of these monitoring features, and basic time tracking features such as adding time manually, and tracking time while you work on an activity (though this last option is only available from one of Hubstaff’s desktop apps, and not directly from the browser). You can then generate Reports. Hubstaff’s free plan offers limited monitoring features, such as screenshots, and basic time tracking features for 1 user, but teams will have to upgrade to a paying plan to get the same features, and some additional features as well, such as application tracking and Auto Payroll. Overall, Hubstaff’s features make it suitable for remote teams and large companies. TimeCamp offers basic time tracking features, but also invoicing and employee monitoring. This app offers tracking time as you work on an activity, adding time manually, and also automatic time tracking. You can then edit time entries and later generate reports. You get the basic time tracking features for free for 1 user, and the paying plans offer these features for a larger number of users, as well as exporting options for Reports, manager approvals, invoicing, staff scheduling and other features. Overall, TimeCamp features make it suitable for small businesses that make invoicing and employee monitoring an imperative. RescueTime is an automatic time tracking app suitable to track how productive you really are. 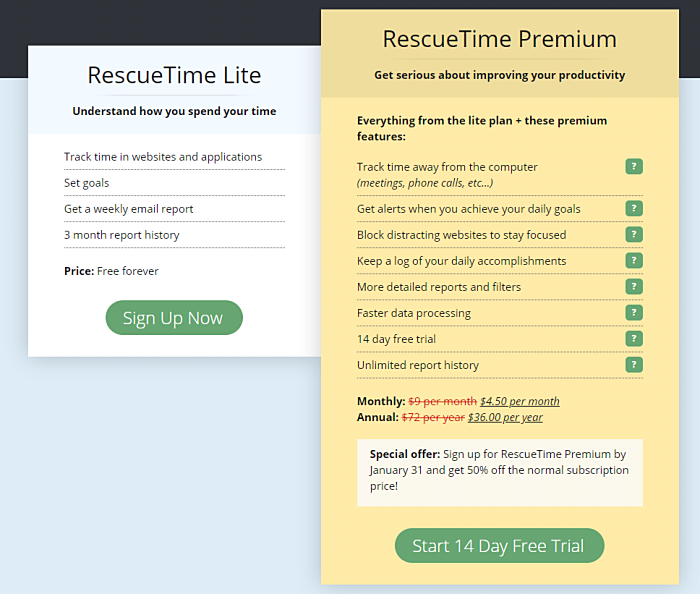 With RescueTime you can try out automatic time tracking to measure how much time you spend on websites and apps. You can then generate basic Visual and weekly Reports. RescueTime offers these features for free, and you’ll need to upgrade to a paying plan to export data to CSV, and add extra details to your visual Reports. In general, Rescue Time’s features make it suitable for individuals who are mostly interested to track their personal productivity. TSheets is a time tracking app with GPS, clock-in/clock-out features, and scheduling features. Here, with TSheets you can add time manually or add it in a timesheet. And here, you can generate various reports, once you’re done with time tracking. 1 user can use these basic time tracking and reporting features for free, and an upgrade to paying plans provides the basics for unlimited users and projects, and also staff scheduling, among other features. TSheets’ features make it suitable for large and mid-size companies mostly interested in employee monitoring. For a super detailed feature-by-feature breakdown, check out the comparison of the 12 best time trackers in 2019.